My husband was snoozing in the seat next to me on our evening bus ride back to Cusco. We had been up since 3 AM, but I couldn’t quite get my brain or my heart to calm down. We hiked roughly thirty miles over the previous four days. That morning, we summited the ancient and sacred site of Machu Picchu. We had walked through jungles, forests, valleys, mountain ranges, ruins, fog, rain and sun. At the highest elevation, we hiked to approximately 14,000 feet. I hadn’t showered properly in almost five days and was running on adrenaline, coca tea and sheer determination. After four days of disconnect from the outside world, I was finally catching up and processing our journey. As I sat reflecting on the whole experience during that bus ride, I realized there was more to it. Under the notes application on my phone, I quickly typed out the eight things on my mind at that moment. They were short and to the point, but they accurately depicted what it was really like. The most obvious and persistent thought on my mind! My feet were very sore. My muscles had adapted well to the uphill and downhill as I am accustomed to hiking. By day three, I felt like I had gotten a really good workout. But my feet were another story! Hiking boots provide you with a lot of support and traction. But when you walk for 28 miles, your feet are bound to hurt. Every step was like dragging dead weight. I was more than ready to kick off my shoes and get a foot massage! This one snuck up on me. We applied bug spray multiple times a day. While walking through the various zones and climates we traversed, bugs were all over and we could both hear them and see them. When no bites appeared anywhere the first two days, I assumed that our bug spray was working perfectly. By day three, it was a completely different story. various red bumps had begun to appear on my legs, feet, and arms. These mosquitoes are strong little guys. These are no minor bites - they itch like crazy to the point where if you aren’t careful, you’ll bleed or scar. By the last day of the trek, bites were appearing on my body in groups of two or three every hour. Not only were my feet sore from hiking, but my legs were becoming permanent scratching posts. Oh man, the dirt, grime and layers of gross all over me! While I did manage to take a five minute freezing rinse at the campsite the night before, it wasn’t enough. The water was so cold I couldn’t even stand under it. All I managed to do was to cup my hands and throw water on myself while trying not to scream at the temperature! I considered myself about 80% clean after that. On the final day of the trek I managed to get the most sweaty and gross of all due to the heat, humidity and climbing Huayna Picchu. Four full days of exercise without a proper shower will make you realize how much you smell, and how much you value being clean! We ate like kings on the trail. Our trekking company provided complete and delicious meals each day that we barely had any need of bringing our own snacks. Each breakfast was a combination of fresh fruit, eggs, ham, pancakes, tea, coffee, juice, cereal, toast and dulce de leche. Lunch was multiple courses including an appetizer, soup with bread, then a main course with side dishes. Happy hour every afternoon included no alcohol, but tea and coffee, plus cookies, crackers and freshly popped popcorn. Dinner was similar to lunch with multiple courses. The food was absolutely delicious and there was more than enough for us. The only issue was that my stomach couldn’t quite handle the amount. Be it high altitude, adjusting to a different country, or traveler’s sickness, my stomach was not feeling great by the end of the trail. I had barely eaten anything that entire day and as such, I was ravenous. By the time we were heading back to Cusco, my stomach was growling and I was ready to eat anything and everything. Tired was no where close to the weariness inhabiting my body. After the amount of physical activity coupled with the lack of sleep, I was beyond exhausted and deliriously tired! I just couldn’t stay asleep at night. I would wake up constantly never stayed asleep for longer than an hour a time. One night I woke up due to the sheer intensity of the wind. It was so strong on the mountainside I thought the tent was going to fly away! By day four, my body was ready for a real bed, sheets and uninterrupted sleep! Reaching Machu Picchu on that final morning was surreal. I couldn’t fathom we had actually made it! I was also proud to have made the journey with my husband, and with our incredible team and fellow hikers in our group. Our group was filled with wonderful, dynamic, interesting people. Our guides taught us the ways of the Quechua culture and the history of the Incas. Not many people can say they’ve been to Machu Picchu via the Inca Trail. But we can, and there’s something to be said for that! When neither my husband or I had any major issues on the trek, (altitude sickness, cuts/bruises, or worse), I was thrilled. We kept a good pace while hiking, staying near the front of the group the entire time. Our concern of being last or not making it was far away and replaced with an overwhelming sense of pride. We worked really hard to make sure this trip was a success. We spent numerous hours planning, packing, obtaining emergency medications, acclimating to elevation and preparing as much as possible for the worst possible scenario. It was also the rainy season and we were bound to get bad weather. Accounting for enough toilet paper, sunscreen, bug spray and appropriate clothing were additional important items on our checklist. When we made it through the hardest hiking day and successfully made it to Dead Woman's Pass (13,800 feet), I immediately felt relieved. If we could make it through the most challenging part of the trek, we could definitely finish the whole thing! By day four, I was in disbelief. We had done it! We had no sunburns, no major injuries, falls, or illnesses. We had prepared as much as possible for this and when the whole thing finished as a success, I felt our hard work had really paid off. More than any pain or discomfort, lack of sleep, bug bites, exhaustion or hunger, what I most felt was gratitude. 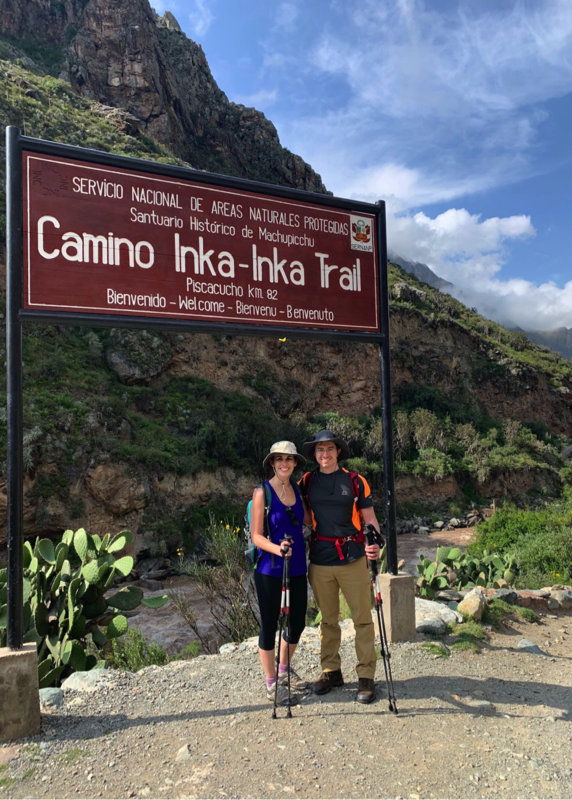 I could not have felt more grateful to have been given this opportunity to hike the Inca Trail. Our weather had been beautiful and not typical of the rainy season- each day the views were something out of a storybook- sunshine, fluffy white clouds, and stunning natural vistas. The rain and thunderstorms only came at night and quickly passed by morning. This sacred pilgrimage route of the Inca Trail depicted such wondrous natural beauty. Everywhere we looked was an example of various microclimates, flora and fauna. The mountains loomed over us but not in a terrifying way. Instead, they welcomed us and guided us along our path. Colorful flowers, iridescent butterflies and green terraces dotted the snow capped peaks and landscapes. The landscape and stunning country of Peru were not the only things that left me feeling indebted to this experience. Our small group was filled with amazing and fun people from all over the world. We supported each other, sang songs, played games, and shared so much in such a short time. We all quickly became fast friends and to be honest, it was one of the best parts of the trek. The other people on our trek who made this trip a success were our guides, Jose and Filio. They checked on us, offered us advice, told jokes, reminded us to drink water, and provided us with encouragement along the way. We also felt indebted to our porters and entire team for carrying our tents and camping equipment. The porters carried 65 pounds each! Without them and our lovely chef, who cooked for us, gave us afternoon juices and coca tea, we would not have been successful. Leaving our new friends in the group, along with our entire team on the last day was almost harder than the most difficult day on the trail! I felt so indebted each and every one of them and felt like we had known each other for years, and not days. I was the one was person who cried when saying goodbye. We learned a few Quechua words on the trek during our four days with the porters. Most of them spoke only Quechua, and a few spoke both Quechua and Spanish. None of them spoke English. “Sulpaiki” was one of the first words we learned. It means “thank you.” The other word we learned was “Pachamama.” It appeared on the t-shirts and bags worn by the porters, with sayings of “We love Pachamama.” While I was curious as to what it meant, it didn’t come up right away. During a planned break on an uphill stretch on our first day, we stopped to rest in the shade by a quaint village. Underneath a hut, we sat down and drank water to stay hydrated. José grabbed a cup of chicha, a corn-based Peruvian alcohol from a local woman selling it on the side of the road. Filio followed suit and grabbed a cup as well. As Jose finished explaining the process of making and brewing chicha, he turned his plastic cup to the side, allowing some of the beer to fall on the ground. Filio immediately did the same. Thinking it would be wasteful to lose even a drop of their precious drinks, I was about to ask why, when my unspoken question was answered. I am not Quechua, nor Peruvian. But this gesture really resonated with me and my Inca Trail trek. That small pouring of chicha on the ground was humbling and inspiring. It was a symbol of recognizing the path before us and paying homage to it. We didn't just hike the Inca Trail, but completed a pilgrimage - a sacred journey. When we arrived to Machu Picchu early that morning, I knew that my experience had been much different than those who just took the bus. It meant so much more. Follow Jennifer Fitzpatrick on Instagram and read more travel stories on her blog! And of course, visit Machu Picchu with us on our Classic Machu Picchu and Cusco itinerary!